There is a sports medicine idiom that states that for everyday you work out with pain, it takes two days of rest and rehabilitation to be made healthy again. The implication is obvious: don’t work out through pain if you want your training to continue uninterrupted. However, most athletes have aches and pains from time to time, and you need to know when soreness represents an injury, and when it is simply an expected result of training. The general rule is that if you feel pain in the same area on two separate days of training in a seven day period, YOU ARE INJURED, and you need to take immediate action. The operative word when it comes to injury management is “action,” because rest alone does not heal the type of overuse injuries endurance athletes suffer. Sometimes, however, pain and soreness is more subtle, and it can be difficult to assess whether it truly represents an injury. In these instances further assessment is necessary. It usually bodes well if the soreness you experience is bilateral, meaning it is in the same location on both sides of your body (i.e. both hamstrings or calves). This “matching” soreness can be expected after performing a more strenuous workout than you are used to. Bilateral soreness will likely resolve within a few days and does not represent an injury. If the soreness is a little better or less intense after each successive day, then it is safe to do easy recovery workouts until the soreness clears up. However, if the pain is in the area of a joint or is unilateral (i.e. on one side of your body and not the other), then it is more concerning — and you have to make the call whether to continue to work out. The first, and hopefully obvious rule regarding working out when you are injured is that if you have pain in activities of daily living, including walking, climbing stairs, bending over, etc, then you can expect your workout to aggravate the injury. Similarly, if you are pain-free in daily activities, only to have the pain return with exertion (even if it feels better after you warm up), you should skip the workout and instead work on healing the injury. Luckily, understanding the mechanism of injury will help you solve the problem. The most common injuries suffered by athletes and fitness buffs are related to overuse of various soft tissue structures, rather than trauma. Workouts routinely subject your tendons, ligaments, and fascia to stress, and only if time for recovery is provided will those tissues respond by healing to stronger states than before. This is called the super compensation principle of adaptation. Conversely, overuse injuries occur when your workouts outpace your body’s ability to adapt to the stress, and the tissue breaks down over time. This can occur if you increase the intensity of your workouts too soon, or work out too hard and too often without allowing for recovery. All common overuse injuries represent the vulnerable areas of the human body where forces are concentrated during repetitive movements. 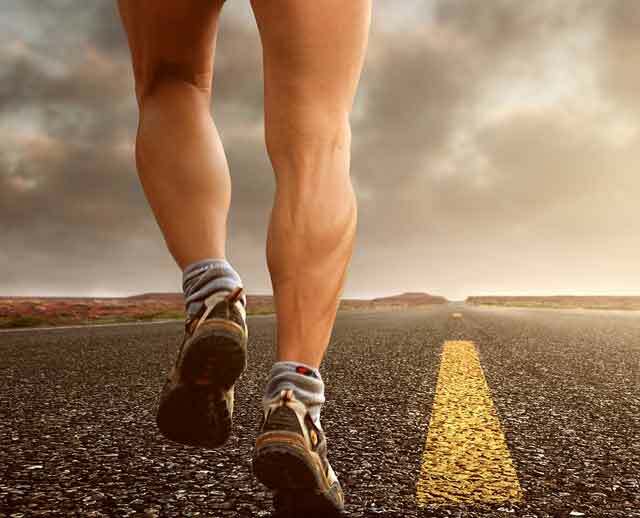 Achilles tendonitis, plantar fasciitis, runners’ knee, hamstring strains, IT band syndrome, tennis elbow, and rotator cuff tendonitis are just some examples of injuries in areas of the body where the tissues are easily overloaded and frequently injured. If you experience pain in any area twice in one week, you must follow these injury-management procedures to avoid being sidelined and losing your hard-earned fitness. First, remember the term R.I.C.E. It stands for Rest, Ice, Compression, Elevation. Rest is essential for the system to begin to recover. Ice is critical to flush the inflammation which is normal to occur for an injury. Compression with tape or an Ace bandage is important to keep the area stable and prevent too much adema from occurring. Elevation is important to try and place the injured area above the heart. By doing this, the circulation will use gravitys force to keep too much inflammation from occurring. Remember, inflammation is the bodies naturally occurring response to an injury. Blood heals everything, so let it do its job. Just don’t allow too much blood to stagnate and pressurize the area too much. 3) Check your equipment for wear and tear. This includes footwear, racquets etc. DO NOT WORK OUT THROUGH PAIN! If these measures do not eliminate the pain, please call Ben at Improvement of Movement, 310.993.2900 for an evaluation to identify your injury and, more importantly, to look for the biomechanical cause.